The city of Seville became Spain's third largest city most visited by tourists from all over. Being the capital of the province of Andalusia has an area of 140.8 km2, is full of monuments and tourist scenarios. Both this, as its historical and parties there, attract many visitors from abroad to spend their holidays in Seville. Also people who are on a tour of Barcelona or Madrid make a getaway here to know also this city. Only around town fills you with its history and drives you to know more deeply. Among its most important landmarks known to the Giralda, the Archive of the Indies, the Cathedral and the Alcazar declared World Heritage Site by UNESCO. The city also can palaces and a lot of churches. No need to worry much thinking what is the best time to visit the city, since most of the year is perfect for traveling to Seville. Summers are hot and dry, the warmest month is July. Similarly winter is also very mild, the days are colder in January but nothing extreme temperatures. Although the whole year is excellent for sightseeing in Seville, one can say that the best seasons are spring and autumn. The rains in the city are very limited, there is only an average of 52 rainy days in the year. The month with the most rainfall recorded is in December. This also brings a lot helps Sevilla to be one of the most interesting tourist spots. To move within the city can use the city bus services, they offer different cards 1-3 days you can travel as many times as you need for a fixed price. The trams are also widely used, ranging from the Prado de San Sebastian and Plaza Nueva. It is a very good option to get around the city. The metro is also another very good alternative. Getting around the city by bicycle is very common in Seville. The streets are made with special lanes and you can also rent a bicycle from any of the 245 stations located in the city. Many tourists use taxis because they do not know the utilities networks and do not want to get lost in the city. There is also the option to rent cars but you know well all the roads and streets of Seville. During our trip to the city probably will need to make a purchase, in Seville will find a lot of shops and markets. The best-known market town is the "Thursday", a show in which we find new and used items such as clothing, books, decorative objects and furniture, among other things. 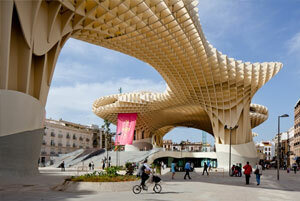 Within the historical town of Seville is located the large commercial area of ​​the city. There you can find and buy everything we need. Among the products that best buy as mementos or souvenirs from Seville are the fans, lace, pottery and crafts in blankets. Besides flamenco dresses, castanets and guitars.